Put 300-plus miles on my motorcycle Saturday, riding mountain roads and stopping only for gas and to view the beauty of a country that I love, have served, and now appear doomed to mourn. On my Harley, I’m removed from the mind-numbing tsunami of political propaganda of cable TV, Internet chatter and radio rancor. While traversing winding roads through the Blue Ridge, I have neither the time nor the desire to deal with the mediocrity of partisanship and ponder why too many have lost the ability to display an outmoded concept of independent thought and rational political discourse. At one time, I actually hoped we as a nation could rise above the partisan blather and put a nation’s soul ahead of political demagoguery. I had hoped we could place the interests of society ahead of narrow-focus political pandering. Alas, I tilted at another windmill. Perhaps the average citizen, numb from a constant barrage of propaganda from both sides of the philosophical spectrum can no longer overcome the single-minded hypnotic state of partisan political posturing. Perhaps open-minded, rational debate is no longer possible in a nation controlled by anger and intolerance for differing viewpoints. Political dogma demands one-sided, blind acceptance that one side must always be superior to the other. To the left, anything conservative is evil and a lie. To the right, the left lies and wants to ruin the country. Of course, neither extreme is true. To those who accept the broadcast half-truths of Glenn Beck on the right or Keith Olbermann on the left, there cannot be two sides to an issue. In a world of political spin, truth becomes irrelevant, even arcane. In a partisan political world, compromise is a sign of weakness and coalitions cannot exist. I’ve been a player in this game for more than four decades — both as a journalist and as a political operative. In those 40 years, I’ve watched America become more divided, more partisan and less willing to put love of country above petty political interests. I’ve watched rich special interests become the ruling class because they, and they alone, have the money, resources and power to control our elected officials. I’ve learned that a society that places unearned importance on party labels and identification is a society headed for destruction. America today is not progressive, but regressive, retreating into fears and stereotypes of the past that, unfortunately, will drive the anger and intolerance of the future. I stopped at an overlook on the Blue Ridge Parkway and chatted with a couple from New Zealand who are nearing the end four months of touring our country on a BMW 1200 RS bike. “Didn’t meet many who would agree with that sticker,” he said. Deidre Case said they ran into a lot of people over the past four months who proudly and passionately told she and her husband that they were a Democrat or a Republican but very, very few who displayed any similar passion as simply an American. 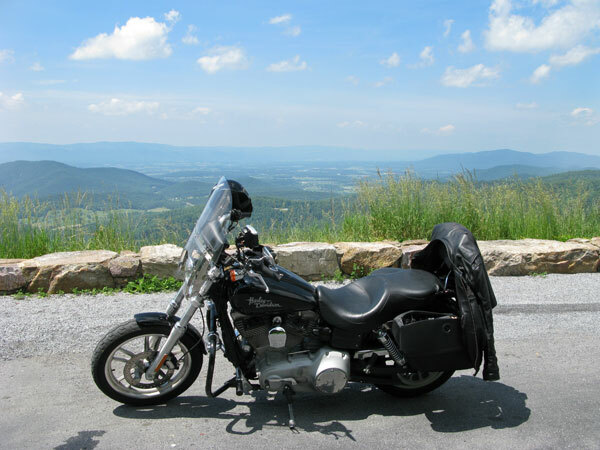 As they rode off, I looked out over the panoramic beauty of the Shenandoah Valley of Virginia, a pastoral scene that seems so calm and serene from 3,000 plus feet.